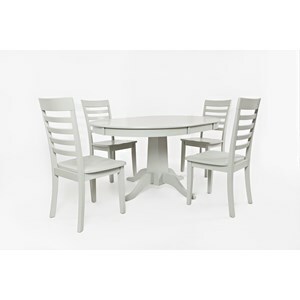 The Everyday Classics Round to Oval Dining Table and 4 Chair Set by Jofran at Bennett's Furniture and Mattresses in the Peterborough, Campbellford, Durham, Lindsay, Haliburton, Bancroft, and Kawartha Lakes area. Product availability may vary. Contact us for the most current availability on this product. Browse other items in the Everyday Classics collection from Bennett's Furniture and Mattresses in the Peterborough, Campbellford, Durham, Lindsay, Haliburton, Bancroft, and Kawartha Lakes area.